Travertine tile is a go-to natural stone material used in stunning homes and stylish businesses all over the world. Its timeless beauty blends seamlessly into traditional and modern décor styles, and its understated elegance adds rich depth to any room it graces. There’s more to travertine tile than you might realize if you’re just starting the building or remodeling process though. One of the key things that differentiates travertine tile is the finish. When you’re shopping for travertine, you’ll see tumbled, honed and polished varieties regularly. Keep reading to learn more about how they’re different and which one is right for your home or business. Tumbled travertine is a unique style of travertine that’s created by literally tumbling many pieces of similarly-sized stone with abrasive materials and water in a large barrel. 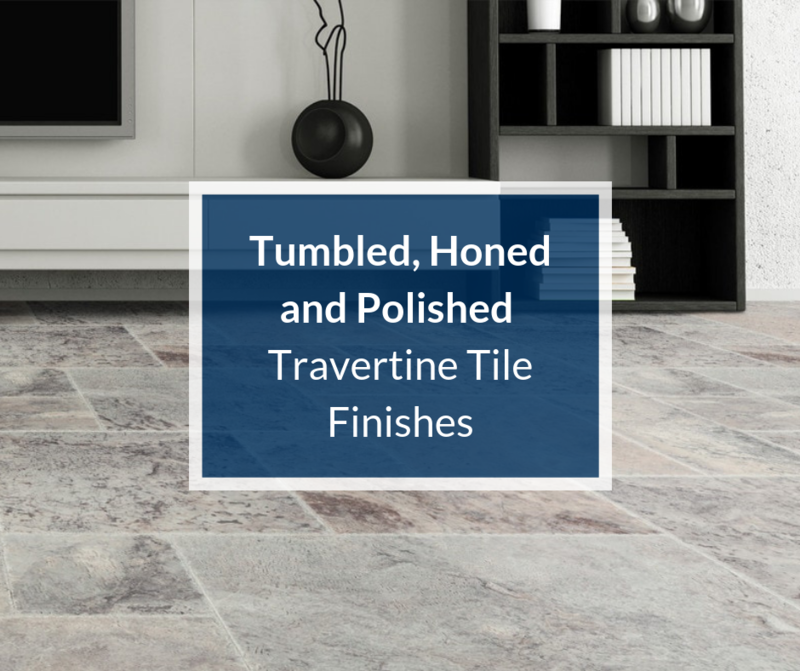 While it might sound haphazard, creating good looking tumbled travertine is actually a refined process and proper packing of barrels ensures a relatively even finish on all pieces. Depending on the desired look for the tumbled travertine, the whole process can take two to five weeks, though this may be streamlined by some manufacturers. Typically, finished pieces of travertine will be tumbled an additional two to three times before they ready for use. Providing a rough, earthy look to your home or business, tumbled travertine can add incredible style to your space. Showers, spas and wet areas spaces. Outdoor spaces like landings, patios or walkways. 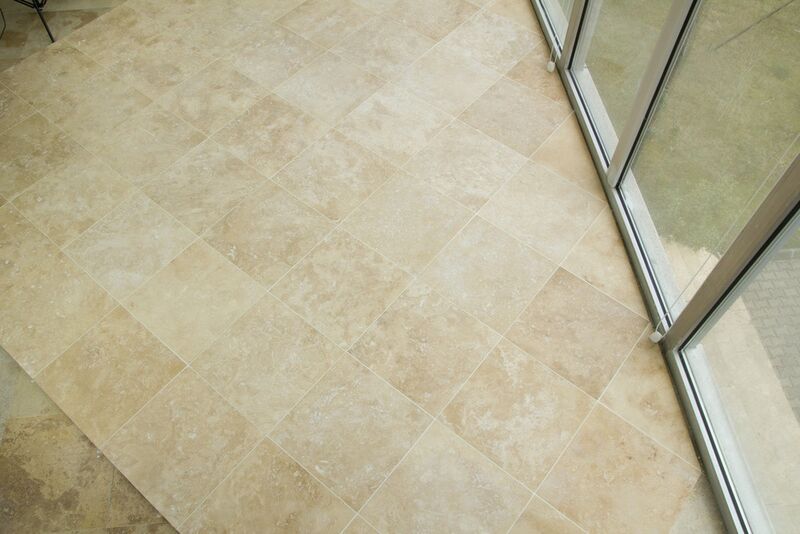 Tumbled travertine is generally left unfilled, which adds to the natural look of this style. However, if you prefer something a bit more modern, you can ask your installer to use grout to fill the travertine for you. It’s important to note that tumbled travertine should be sealed before and after grout is applied. This will protect your finish and ensure the longevity of your stone. Honed travertine tile has a smooth to the touch finish that’s a little bit more modern than tumbled travertine tile. However, it’s still a natural looking finish that’s very versatile, so it can be used in traditional and transitional spaces with ease. Achieved through a process where one side of the natural stone is ground down with variable grit materials, honed travertine tile actually comes in a few different looks. Typically, you can find matte, satin or higher sheen honed travertine, one of which may be a better choice for your overall design aesthetic. Indoor flooring in living rooms, dens and kitchens. Outdoor spaces like patios or walkways. Bathrooms. Honed travertine is often used on floors and on walls in the spaces. It can also be used for bathtub surrounds. In wet areas, like a walk-in shower or spa. Around swimming pools, saunas and hot tubs. Honed travertine tile can be used filled with grout or unfilled, with filled styles being the most common. For wet areas, filled travertine is preferred for longevity reasons. Polished travertine tile is an incredibly popular option. It’s glossy, sophisticated look adds a touch of class to any room, and while it’s often used in modern spaces, it’s just as at home in more transitional or vintage-inspired houses and businesses as well. Created in a very similar fashion to honed travertine, polished travertine is typically ground down with a specific-grit abrasive product. This may be done in different steps until the desired look is reached. 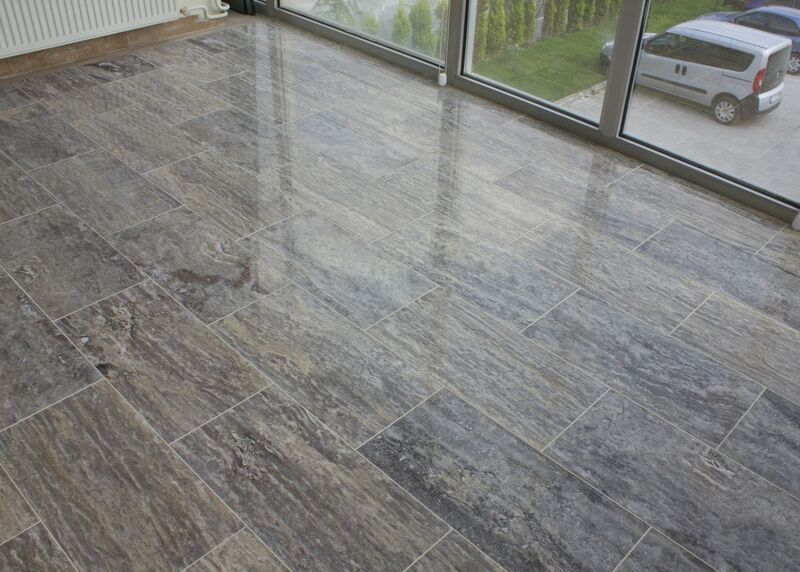 Indoor flooring for living rooms, dens, bedrooms and kitchens. Bathrooms. 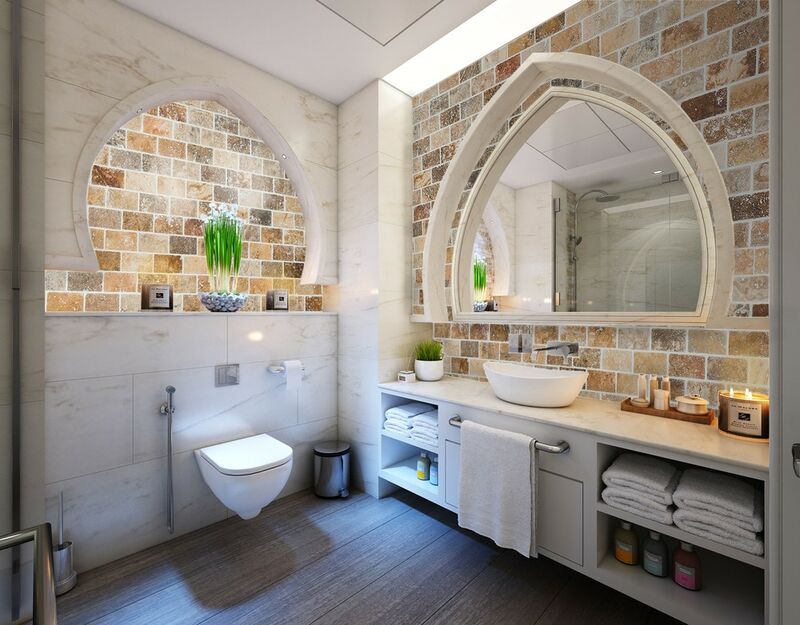 You can use polished travertine in bathrooms, but it should not be placed in wet areas like walk-in showers. Backsplashes and surrounds for kitchen sinks. Polished travertine is typically filled, giving it a uniform look that’s traditional to this type of stone. Many people use sealants on top of filled travertine to provide an even more modern, high-gloss style. Left unsealed, polished travertine will age naturally, looking older as the years pass. You can prevent the aging process by sealing your travertine every few years. Many people love the slick look of polished travertine, especially if they’re building or renovating a modern however. However, you should avoid using polished travertine in your shower, near the bathtub or in outdoor spaces. The slick nature of polished travertine can make it dangerous to walk on when it’s wet. Instead, look to honed travertine in a satin or high gloss style to get as close to the appearance you’re after as possible. Which Travertine Tile Style is Right for You? Tumbled, honed and polished travertine are all beautiful, useful materials that will look great almost anywhere you put them. Deciding which one is right for you often comes down to how you’re going to use them and the overall look you want. In general, traditional spaces tend to look best with more natural looking travertine tile. High shine options may be a bit too bold, bright and shiny for these areas. In more modern spaces, polished travertine often has the edge since it’s glossy look will fit better with most styles of contemporary décor. For outdoor and wet spaces, tumbled and honed travertine tile is your best bet. Polished travertine might provide a nice appearance, but it’s far too slick for outdoor use.